Celebrate spring with a day of flowers and fun! 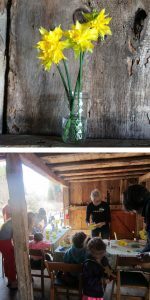 A daffodil display in the Arboretum’s Far Barn will showcase a range of varieties in vases, illustrating the large variations in this species. Enjoy family-friendly arts and crafts, and warm beverages. Join staff for an 11am guided tour to see the spring-flowering bulbs planted in honor of the Arboretum’s 20th anniversary in bloom for the first time. This event is free and open to the public.